You will notice that a different data types require different amounts of storage space. 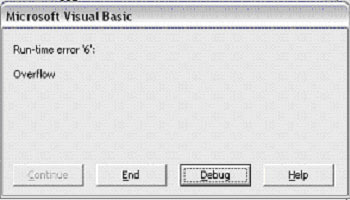 This is because Visual Basic stores each data type in a different way. 2. You should see the word General in the dropdown box in the top left of the code window. 4. Return to the form and double click on the Form to get tot the form's Load event code. Type in the following lines. 5. Save your work and test your program. Remember that there is a limit on the size of the Integer data type. Try typing in a six digit number into the one of the boxes. You should get an error like this. How would you change the program if you needed to add larger numbers together? The scope of a variable indicates which parts of the program can use it. There are 2 types of scope, Global and Local. Global variables are declared at the top of the form in the General section. Global variables can be used in any part of the form. Local variables are declared inside a procedure like the form's load event. Local variables can only be used inside the procedure where they have been declared. 1. Open a new project and place a command button named cmdOK on the form. Click on View Code and type the following in the General section of the form. This will be a global variable. 2. Type the following in the form's Load Event. 3. Double click the command button to bring up its event procedure. Type in the following. 4. Run the program. The variable strSurname means something different to the program when the OK button is clicked. When the form is loaded, the global variable is used.